To cover this event, we deployed three cameras across two crews. The idea was to go deeper with one of the contestants and still get to know a range of them across the various issues. Erica Matson and I took the early shift in lower Manhattan. 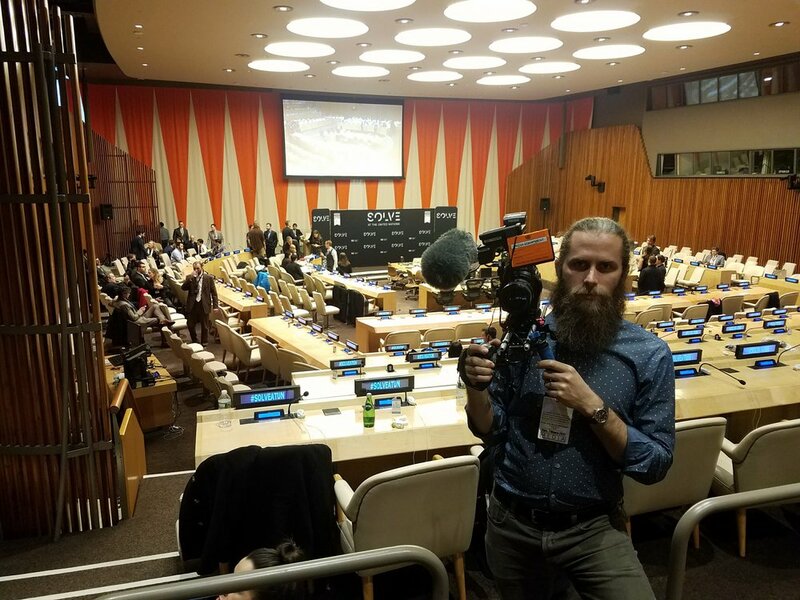 While we spent some time observing then interviewing Mohsin Mohi-Ud Din as he nervously prepared for his 3-minute presentation, our second crew including operator Chris Herde hosed down the UN and the preparations there. During a break between presenters. They rigged a C300 with a lens doubler and a Canon L-series 70-200 in a press box on sticks. At the same time, Chris moved around the floor of the assembly room with a C300 and a Sigma 50-100. When we arrived with Mohsin, we touched base then I joined Chris on the floor for the event. It lasted a few hours and...you can watch the result of Mohsin's preparations below. I thought it was important to avoid too much polish on this subject - the documentary should be about the initiative young people are taking to better the world rather than acting as an advertisement for a program. We opted to shoot with Canon L series zoom lenses and keep as much of the photography handheld as possible. (3) Canon C300mki, Canon L-series zooms, Sigma 50-100.